WASHINGTON — What could be more Georgetown-hipster than booking reservations to hang out with soft, adorable, homeless kitties in a cat cafe? How about a pop-up kitten lounge. What’s being called the first-in-America kitten-only place to rest, relax and interact with kittens between the ages of three-to-six months will open in early March, at 3109 M(eow) Street NW. 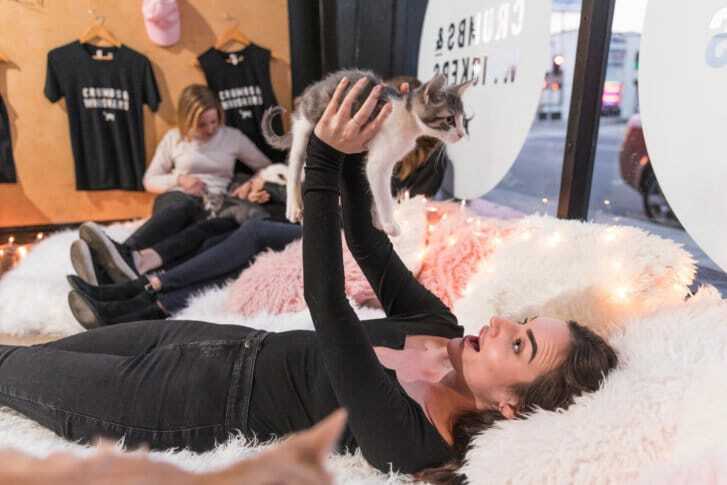 The pop-up, which will be open for at least four months, is being opened in the former location of a Steve Madden shoe store by the team behind Crumbs & Whiskers, which operates adult cat cafes at 3211 O St. NW and in Los Angeles. All of the kittens that will hang out and pose for social media photos with you will also be adoptable. They’ll be provided in partnership with Homeward Trails Animal Rescue. Time spent with a purring, fluffy cat is referred to as an “experience.” While the exact pricing is still to be determined, a reserved 70-minute experience at Crumbs & Whiskers costs $22. A 15-minute walk-in-only experience costs $9. “Georgetown is unique. It’s where locals and tourists go to get a real sense of Washington,” Kanchan Singh, founder and CEO of Crumbs & Whiskers, said. The goal of the kitten and cat cafes is to provide better lives for homeless animals. Crumbs & Whiskers says it has already facilitated 900 cat adoptions, with nearly 1,900 cats saved from euthanasia, and more than $25,000 donated to charity. The company partners with local rescue organizations. Every year, nearly one million cats are euthanized in shelters due to lack of space. The Kitten Lounge hopes to save up to 500 kittens during the next four months.